The Republican and Democratic positions on what good government towards education looks like were on full display when the Arizona Republic hosted (by reporter Richard Ruelas) candidate debates among the individuals from both parties vying to be the Superintendent of Public Instruction starting January 2019. While the Republican candidates revealed extreme right wing views on issues like Red for Ed, district consolidation, and the new science standards (feel free to access the link to the debates below) this piece focuses on the issues asked of the candidates of both parties: their views on Private School Voucher expansion (Proposition 305) and Invest in Ed. As expected the Republicans and Democrats offered opposing views on the expansion of private school empowerment scholarships (vouchers) as articulated in Proposition 305. Virtually all the Republican candidates expressed support for the proposition, tying into their unified views on championing school choice. Only current School Superintendent Diane Douglas, because of her position, conveyed no position on the issue. The levels of support varied among the candidate. Former Arizona Gubernatorial Candidate and former Congressional Representative (from California) Frank Riggs supports expansion as long as it is means tested and tailored to low-income families. Both Tracy Livingston (a teacher and member of the Maricopa County Community College Board) and Jonathan Gelbart (a director at BASIS) gave unqualified support to the expansion, with Gelbart implying that this is no big deal because it would only affect three percent of the school-age population. Only Bob Branch (an educator and devout Trump supporter who prides himself at teaching at both Christian based Liberty University and Grand Canyon University) said that the expansion does not go far enough, calling it a “band-aid” on the bigger problem of failing schools in the state. 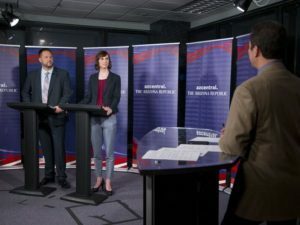 The Democratic Candidates Kathy Hoffman and David Schipara (link to their debate below as well as an accounting of an earlier one in June) expressed opposition to Proposition 305 for virtually identical reasons. Ms. Hoffman sees this as a continuation of Republican orthodoxy (promoted at the top by Secretary of Education Betsy Devos in Washington) towards how to best address education through promoting school choice. Both say the law as written provides no oversight for how the monies are spent. Both say that while there may be benefits to children’s for special needs for this program, they caution that most private schools do not provide the special education services that children need (thereby creating a situation where potentially a child goes to the private school but comes back to the district school for full special education services) and that the tax credit (about $5000) does not fully pay for the tuition at most superior private schools. Mr. Schipara expanded on that, implying that this program is nothing more than a tax cut for the rich. Here the classic arguments for trickle-down economics among conservative Republicans took shape as all the Republican candidates took aim at the Invest in Ed Ballot Initiative, claiming that a tax on the wealthy (or the entrepreneurial spirit) to help fund education would hurt the state economy and cause unemployment to go up. Mr. Branch maintains he would not support any tax increase in any area. Ms. Livingston added she thinks the proposition is poorly written. She feels education funding can be increased through a thorough audit of department and school district expenditures and an increase in Proposition 301 funding. Mr. Riggs says there is no accountability written into the proposal and instead supports increasing education funding through a moratorium on corporate tax reductions. Mr. Gelbart feels the rich would be greedy and shift their assets to other states and thinks the best solution, after recent court rulings on gaming and gambling, is increased taxes on gaming and sports gambling revenue. Ms. Douglas maintained her opposition to Invest in Ed in the spring calling for an increase in the general sales tax, a rise in Proposition 301 tax revenues and possibly an excise tax. Readers will note that most of these funding increase proposals are largely based on forms of regressive tax measures or sin taxes that largely draw funds from the middle class and poor. The Democratic Candidates ridiculed the assertion that the Invest in Ed initiative hurts the rich. Ms. Hoffman countered that the sales tax increases that have been passed over the years have been too regressive on poor and middle-class residents and the priorities of funding teachers, counselors, social workers, special needs and ELL staff should take precedence along with fully funding full-day kindergarten. Mr. Schipara concurred with what Ms. Hoffman stated and added that Invest in Ed was necessary and the tax increase (on people making more than $250,000 a year and married couples making more than $500,000) was only returning state income levels to what they were in 1987. In earlier profiles, both candidates have advocated doing away with corporate tax loopholes to help fund education. Increasing the sales tax would be the last resort for both Democratic Candidates. 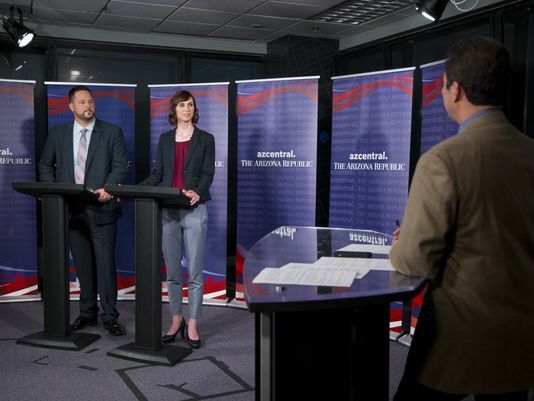 In a debate with Mr. Schipara on the PBS show Horizon on June 15, 2018, Ms. Hoffman said, “Arizona’s future is in our schools.” As evidenced above, the governing philosophies of both political parties offer different policy prescriptions on vouchers and funding our schools. 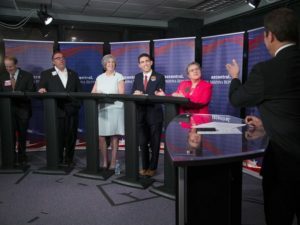 Voters need to analyze the differences between both parties on these and other areas in education (charter schools, education standards, district consolidation, class sizes, school safety, and protecting minority and LGBTQ children) by researching where the candidates stand, what their experiences are, and watching what they say at debates (like the ones below) to determine which party and candidate will better shape the future of our schools and children for the next four years. After doing their due diligence, voters should come to the realization that the two Democratic candidates offer the better vision and direction for taking our state education system forward. Previous articleWhat if Trump Really is a Russian Dupe?